For this holiday, we carefully selected an excellent hotel. It is peacefully located, next to a golf course, in Purmerend. Near the hotel, you can take a bus to Amsterdam. But, we can also go by bike to the capital of Holland. Even in such a big city, there are safe cycle paths. Unlike our other tours which have set itineraries for different days, this tour gives you 4 suggested cycle tours and you decide what days you would like to do them. The first town you can discover during this tour is Edam. Edam was a flourishing town in the 16th and 17th century because of its cheese & fish trade and the shipyard. Edam has a picturesque town center with typical houses and canals which date back from the 17th and 18th century. From Edam you will cycle to Hoorn. Hoorn calls itself “the pearl of the Ijsselmeer”. Hoorn was founded in the 12th century. After the establishment of a division of the United East-Indian Company (Verenigde Oostindische Companie, abbreviated VOC) in 1602 the town gained international importance. Hoorn is also famous for its well-known sailors such as Willem Cornelisz Schouten and Jakob Le Maire who rounded for the first time Cape Horn in South-America about 400 years ago. This tour goes through the polder landscape of the Beemster. The polder with it’s well preserved 17th century farmhouses, old rectangular street pattern and the old windmills in the village of Middenbeemster has been classified by the UNESCO as world heritage. The church of Middenbeemster is truly worth a visit. During this tour you can see and do many things. First of all you can visit the town of Volendam. Volendam has several particularities: its customs e.g. the inhabitants of the town speak a dialect (Volendams) and on special occasions typical attire is worn, its wooden houses, its fair, its shops and gastronomy which make the city distinctive of other places in Holland. Further on this tour you will get the opportunity to visit the exciting capital of the Netherlands: Amsterdam. A visit to Amsterdam is certainly the highlight of this bike holiday. This tour will bring you to one of the loveliest places of Holland: the Zaanse Schans. The Zaanse Schans is a famous open air museum where you are thrown back into the Holland of the 18th and 19th century. Between 1961 and 1974 some old buildings of the region around Zaandam have been transported to the Zaanse Schans. The windmills here have carefully been restored. You can visit the old houses and also a souvenir shop, a cheese farm, a shipyard, a clog workshop, a bakery museum, a clock museum and the only dye windmill in the world. 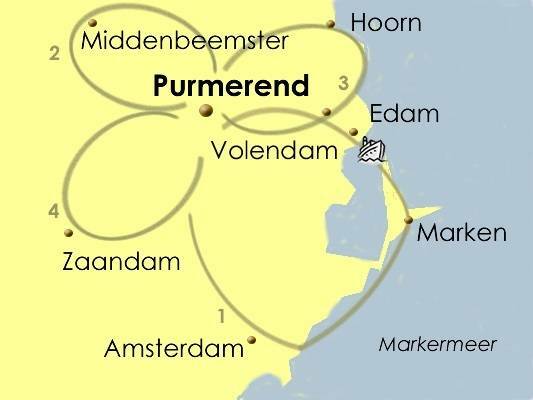 This tour is based in Purmerend. A rural location only 15 minutes from Central Amsterdam. Easy and flat and suitable for cyclists and families. Arrival We drive to Amsterdam. You need to follow A10 in direction of Ring Noord Amsterdam/Zaanstad. At the crossing “Coenplein” after about 16 km you need to follow A8 in direction of Zaanstad/ Purmerend. At the crossing “Zaandam” you take A7 in direction of Purmerend. We leave the highway A7 in Purmerend Noord. We take direction Purmerend-Noord and Volendam (N244). You stay on the N244 till the third traffic lights. There, you TR in direction of industry park ‘De Baanstee’. At the T-crossroads, you TL and you take the second road to the right. You are now in the Westerweg yet. Public Transport: you can go by train to Amsterdam Central. There you can take bus 307 till bus stop ‘Bunderstraat’ in Purmerend. The hotel lies within 5 minutes walking from the hotel. Carparking: you can park your car for free on the parking place of the hotel. Flights: are available with a number of airlines to your required airport or you can travel to the start using alternative methods such as rail or road. The Amsterdam and North Holland cycling holiday includes the daily transfer of luggage to the next hotel and local support if required.